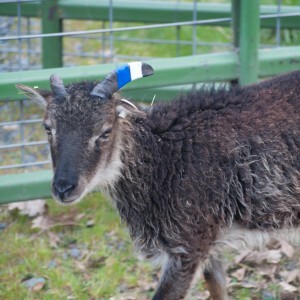 So you’ve decided you want to start a small flock of Soay sheep and you have, or can put together, the infrastructure to support your new flock: pastures or a barnful of hay, secure fencing, water and shelter, and predator control appropriate to your location. But what about the starter flock itself? How many sheep do you want to start with? One ram or two? What are your breeding goals? Within the confines of trying to assure genetic diversity, do you want a completely random mix of colors (brown, tan, black/very dark brown) and spotting? 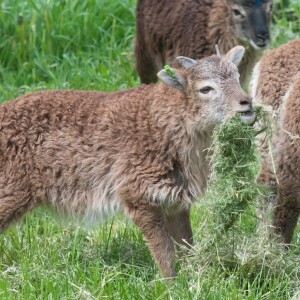 Or would you like to nudge a bit towards more very dark-fleeced Soay, or try for a little more spotting, or some other priority? Once you’ve thought about what your preferences are, how do you go about putting together your ideal starter flock, or coming as close as you can? Let’s start with numbers. Most people begin their flock with between three and six ewes, depending on the farm setup and budget. If you are able to find a breeder who has a few unsold yearling ewes, you have the option to combine yearling ewes and new ewe lambs in your starter flock. This mix will allow you to breed the yearling ewes right away in the fall while you let your new ewe lambs mature for a year first. If you want to let your flock settle in for a year before breeding at all, you can start with all ewe lambs. Deciding about rams is sightly trickier. 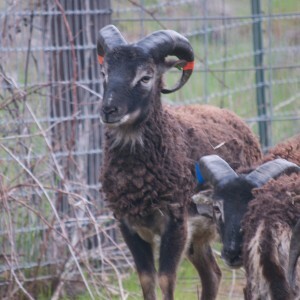 When we receive requests for starter flocks with just one ram, we try to persuade people to begin with two rams and a wether, or three rams, and here’s why. 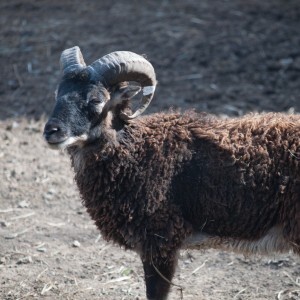 Unless you are purchasing from a breeder within a day’s drive of your farm, if something happens to your single ram, you’re facing another delivery charge. 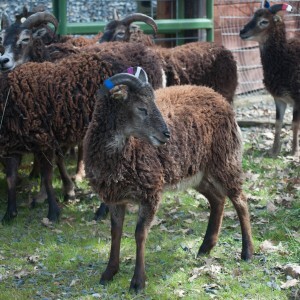 In the first years, when your flock is small, you probably will use just one ram each breeding season to give yourself the most time to use your original group of rams before needing to introduce new breeders. Starting with two rams in the flock gives you a minimum of four years before you have to even think about introducing a new ram. [Until I have time to do a post on this, call me for how it works]. 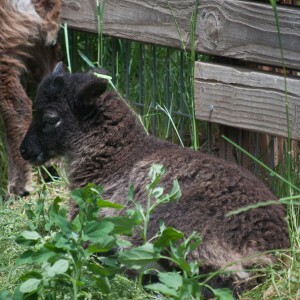 But that first fall, when the lucky breeding ram goes in with the ewes, his buddy will be left alone, not a good thing. Having a wether or a third ram gives you built-in companionship for whatever rams aren’t going to breed that fall. Once you have a pretty good idea of the size of flock you want to start with, you can think about the physical appearance and breeding potential of your new sheep. There are at least three levels of “choice” you might encounter: (1) if you live near several breeders, you may be able to source your flock from more than one seller and put together a richly diverse flock both in terms of genetics and also variety of coat color and spotting/no spotting; (2) if you live near one large breeder, you may be able to put together your entire starter flock from one source and have the same level (or better) of genetic diversity, variety of color, etc; (3) if you live near only one small breeder you will not have much choice about your first group of sheep, but through your own breeding program you can work towards achieving whatever color and spotting combinations you ultimately would like to have on your farm. For purposes of this post, I am going to assume you can find the diversity you want from one or more breeders. 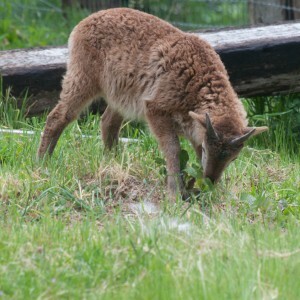 If you prefer brown Soay with no white spotting, you should be able to acquire your starter flock from any of the several dozen RBST Soay breeders in the U.S. or Canada. 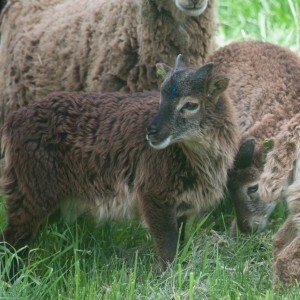 If you want to include either light phase (tan) Soay or white spotting — both recessive traits and thus less common — in your starter flock, you will need to locate breeders who have these traits in their flocks and in the ewes and rams they have on offer. 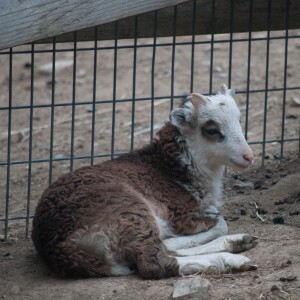 If you are unable to find animals expressing these traits (i.e., lambs that are tan or spotted), you may be able to produce them yourself by including in your starter flock plain brown ewes or rams that carry the light phase or white spotting gene and thus can pass the trait on to their offspring. 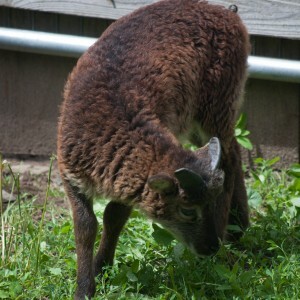 To illustrate all these “what ifs,” I’ve created several sample starter flocks of real RBST Soay sheep. Not surprisingly, these are our sheep so we know what they look like and we know their pedigrees. All of them are available for our existing customers and for any of you still shopping. We had an unusually high number of twins this spring so we still have lambs left for sale. Some of the animals shown here will become part of other customers’ starter flocks, but we have lots of tan lambs and lots of white spotted lambs so we can still fulfill additional orders for flocks with these traits represented. Most importantly, we hope these examples will help you decide what kind of starter flock you’d like to have no matter who you purchase it from. EXAMPLE 1: Potluck — 4 ewes, 2 rams, random colors and pattern. This starter flock provides white spotting, light phase (tan), and a ewe with very dark brown fleece from the get-go. 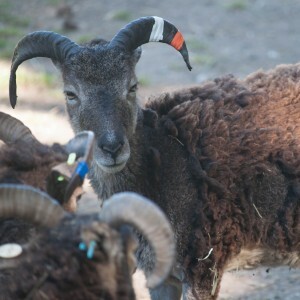 Although neither ram is known to carry the gene for light phase, both rams have tan grandfathers so when bred to tan ewes, these rams may produce tan offspring. If they do, you will know the ram carries the gene (the label for this is “proven carrier,” as in proven by the lambs he produces). Neither ram shares a parent with any of the ewes, so you will not need to hold back a ewe in years when she would breed to her half brother. EXAMPLE 2: Slight tilt towards white spotting but with light phase and black/very dark brown possibilities as well — also 4 ewes and 2 rams. Lovely yearling ewe Bennett carries the gene for white spotting. She is ready to breed and of course will not pass on her broken horn! Ewe lamb with distinctive white spot, better than an Easter bonnet! With two white-spotted ewes and a ram carrier, this flock almost certainly will produce more white spotted lambs as soon as the tan ram lamb breeds. Ironic, isn’t it? But remember, he carries white spotting so when he breeds the white spotted ewes, 50% of the lambs will be spotted and the other 50% will be carriers. Hartwell’s contribution to white spotting will be limited to producing spotting carriers from the two white spotted ewe lambs in the starter flock, but all the lambs will be carriers so that’s another infusion of spotting for later years’ breeding. There are only two known possibilities for adding tan sheep to this flock. 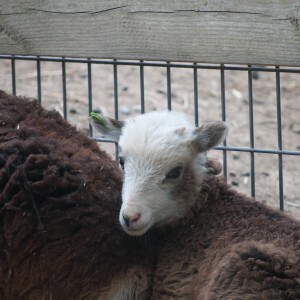 When Hartwell breeds Pollicott, since both of them are carriers each lamb has 25% chance of being light phase, and 50% chance of at least carrying the gene. 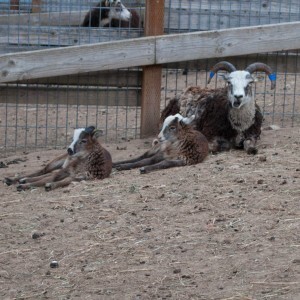 And when the ram lamb breeds Pollicott, 50% of their offspring will be tan and the other 50% will carry the gene. Oh, and did I mention black, or more precisely the very dark brown that came over with AI? 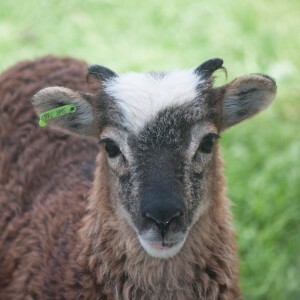 The Hartwell x Pollicott cross also may produce black/very dark brown lambs since Pollicott’s mother Darby was black at birth and Hartwell’s father Lewes was black at birth. 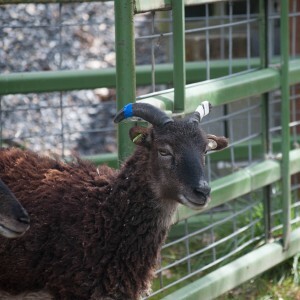 EXAMPLE 3: Preference for very dark, almost black Soay, but still with good genetic diversity — also 4 ewes and 2 rams. 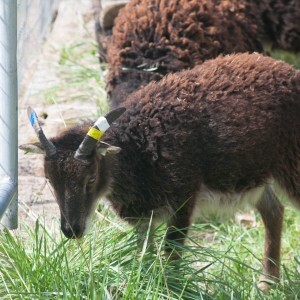 This stunning reddish brown ram’s mother, Heywood, was black at birth. He already has a wide horn set. 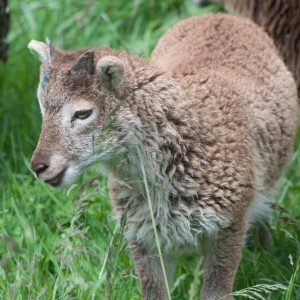 This starter flock will appeal to someone who really does not like white spotting, prefers mostly darker Soay sheep, but still wants robust genetic diversity. It includes lots of opportunities for black lambs that will remain very dark brown as adults, and just for fun I’ve included one fetching little light phase ewe lamb. When she is bred to Hartwell, 50% of the offspring will be tan and 50% will be tan carriers. With a total of 19 lambs, four rams and up to six yearling ewes for sale, I could go on and on with examples of starter flocks, but I think you get the idea. If you have a different notion about which of these animals would make a nice starter flock, by all means give us a call and we’ll be happy to work with you to find a custom flock of the size and composition best suited to your own goals. What could be more fun on a beautiful sunny spring day?